Compact, easy to carry, deep cleanses, battery life is a dream too. It’s gentle, removes impurities better than any other and is travel friendly. There really is nothing bad to say about this cleansing brush. Luna mini 2 is a base of my proper facial care regime. I started using it two times a day and it helped a lot. All that deep cleansing combined with vibrations of different intensities helped my skin to regain it's smooth appearance and to become moisturised because I claim that moisturiser had a better effect after Luna mini 2 treatment. All in all, one handy and very useful device. I had a small one of these and found it good so upgraded to the larger mini 2 which is rechargeable. Use with preferred cleanser and skin feels deeply cleanser and soft. 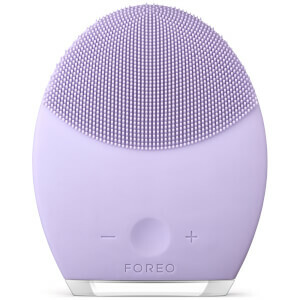 I just love how this face brush cleans my face and leaves it smooth. I think it is important to say that battery lasts very long and is also very easy to charge. I charge it on my laptop. Got mine a week ago and already seen great changes on my skin. It really clears out my congested pores and my skin feels more hydrated and less oily. It’s certainly exceeded my expectation. Definitely a great buy. 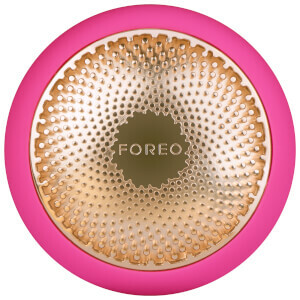 I bought three Foreo Luna, lol, one go for travel, one play for my brushes, and one for myself, and i bought several for my bffs as bday gifts, they love it soooooo much!!!! I love my new sunny mini brush! Could not decide on colour for some time. They are all so cute! Well, regardless of the colour, it cleans so well, gentle yet thorough. Definitely brightens my skin, leaving it smooth and soft. What a BRUSH! 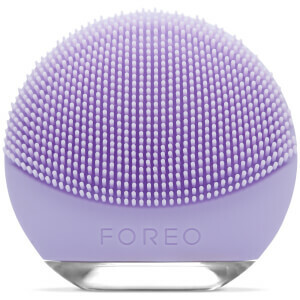 The combination of the silicone bristles and pulsations is genius. My skin looks polished and feels moist. Facial muscles are relaxed. It does not get better than this! Ladies and gents, I absolutely fell in love with this cutest brush! It is ideal for my skin. Not too rough, not too soft. Silicone bristles combined with pulsations do the trick. I use it on higher intensity, it gives a much better cleansing and stimulation. Perfect "wake up" ritual! Creams and serums definitely absorb much better and the you feel the difference pretty much instantly. I would definitely recommend this product!